Washington State Patrol (WSP) officials say they believe that the driver who caused a fatal head-on car collision on State Route 167 Tuesday morning was under the influence of alcohol or drugs at the time of the crash. According to KIROTV.com, 48-year-old Anderson Hamilton was driving a Dodge pickup truck northbound on SR 167 near Puyallup just after midnight on Tuesday when the vehicle crossed the centerline and crashed head-on with a Taxi that was carrying three people inside of it. Officials say that 34-year-old Shanna Huttenstine and her fiancée, 36-year-old Jason Speers, were traveling southbound in the taxi that was struck by Hamilton’s pickup. Huttenstine was killed instantly in the crash and Speers was taken to the hospital but has since been released, while the 52-year-old taxi driver suffered life-threatening injuries and is currently fighting for his life. 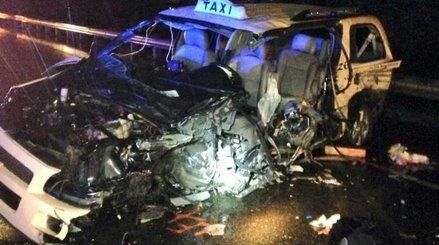 “[The taxi driver] had some very serious leg injuries,” said WSP Trooper Guy Gill. As if this crash wasn’t devastating enough already, various news reports claim that Huttenstine had recently revealed she was pregnant and due to give birth in September. As investigators responded to the scene of the crash, they discovered signs indicating that Hamilton may have been under the influence at the time of the collision. Troopers took a blood sample from the suspect that will be tested for drugs and alcohol, and he was booked into Pierce County Jail on suspicion of DUI. If the driver is discovered to have been under the influence at the time of the collision, he will likely face vehicular assault and vehicular homicide charges. KIROTV.com also pointed out that Hamilton could face additional counts of vehicular homicide if it is proven that Huttenstine was indeed pregnant at the time or if the taxi driver does not survive.